best—connecting people and properties. What does that mean for you? A more expertly facilitated sale of your prized property. information, off-market hip pocket properties, Dallas’ most exquisite and prized estates—all leveraged for your benefit. Thinking of a change? Put the Masters to work for you. ERIN MATHEWS , Allie Beth Allman and Assoc. SUSAN BALDWIN , Allie Beth Allman and Assoc. KYLE CREWS , Allie Beth Allman and Assoc. PICTURED HERE in front of Dallas Rag by Richard Long in the lobby of KPMG Plaza at HALL Ar ts. Enjoy your collection while sitting on a masterpiece.    Shown: Drive sofa in velvet. THERE IS AN ART TO LUXURY. For over 10 years, Dave Perry-Miller Real Estate has set Dallas sales records, representing billions of dollars in property for thousands of satisfied clients. Our reputation as the area’s dominant luxury real estate firm is founded on the combined strength of our dynamic team, dedicated to collaboratively cultivating an intimate understanding of Dallas’ premier neighborhoods, with emphasis on qualit y, charac ter and design. Artistic Tile®, its logo® and Orchid Dimensional™ are the exclusive property of Artistic Tile, Inc.
104 ART IN OVERDRIVE Toyota brings art and community together at North American headquarters. By Nancy Cohen Israel 110 ONE MORNING SPRING AWAKENED AND IMAGINED ITSELF… Fashion selections from the season of renewal. Creative Direction by Elaine Raffel. Photography and illustrations by Geof Kern. On the cover: Alec Egan, Sunset Mountain, 2019, oil on canvas, 60 x 48 in. Photograph by Michael Underwood. Courtesy of the artist and Anat Ebgi Gallery, Los Angeles. DANIELLE AVRAM is a curator and writer based in Dallas, TX. She has held positions at Texas Woman’s University; Southern Methodist University; The Power Station and The Pinnell Collection; and The High Museum of Art. She has an MFA from the School of The Museum of Fine Arts and Tufts University, and a BA from the University of Texas at Dallas. For April, she examined the practice of this year’s Nasher Prize Laureate in Isa Genzken’s Extraordinary Burst of Invention. NANCY COHEN ISRAEL is a Dallas-based art historian, curator, and art tour organizer who looks forward to April’s annual cultural blossoming. 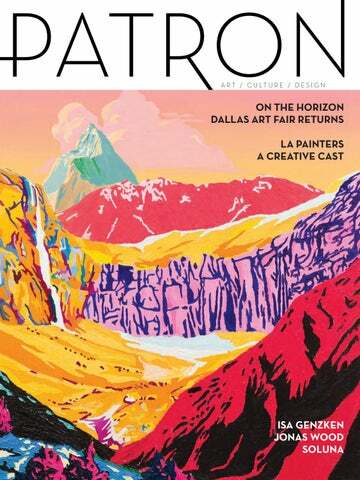 For the current issue, she enjoyed writing about artists from diverse backgrounds whose work will be on view at this year’s Dallas Art Fair. Nancy was also delighted to write about the magnificent collection at Toyota’s North American headquarters. In addition to being an ongoing Patron contributor, Nancy is a regular lecturer at the Meadows Museum. BRANDON KENNEDY is the Director of Exhibitor Relations for the Dallas Art Fair, working with international galleries and assisting with programming for the April event. Kennedy curated The Anatomy of Disquiet at The Karpidas Collection, exploring the nature of Jungian thought and the collective unconscious through almost 80 artworks from their collection. He is an occasional artist, avid book collector, and peripatetic curator, who writes about local artists for Patron’s Studio column. For April he checks in with artist Leigh Merrill. CHRIS BYRNE is the author of the graphic novel The Magician (Marquand Books, 2013) as well as The Original Print (Guild Publishing, 2002). He is co-chair of Art21’s Contemporary Council and serves on the board of directors of Institute 193, Dallas Contemporary, Museum of Contemporary Art Detroit, and the American Folk Art Museum’s Council for the Study of Art Brut and the Self-Taught. He is the co-founder of the Dallas Art Fair and was formerly chairman of the American Visionary Art Museum. LAUREN CHRISTENSEN has more than two decades of experience in advertising and marketing. She consults with clients in art, real estate, fashion, and publishing through L. Christensen Marketing & Design. She serves on the boards of the Christensen Family Foundation and Helping Our Heroes. Her clean, contemporary aesthetic and generous spirit make Christensen the perfect choice to art direct Patron. LEE CULLUM is a Dallas journalist and host of CEO, a series of interviews with business leaders for KERA-TV, who balances her work in business, public policy, and foreign affairs with a passion for the performing arts. An ongoing Patron contributor, in The Music Between the Notes she covers several artistic collaborations produced by the Dallas Symphony Orchestra for their all-inclusive music and arts festival SOLUNA now in its fifth year. JENNIFER KLOS is a Dallas-based art advisor, curator, and the founder of Collector House, an art advisory firm that educates collectors on acquiring art through gallery visits, travel tours, and a YouTube video series. She holds degrees from Vanderbilt University, Christie’s Education, Inchbald School of Design, and Bard Graduate Center. As a former curator at the Oklahoma City Museum of Art, she has worked with artists on contemporary exhibitions and acquisitions. In this issue, she writes about artist Tony Matelli’s sculpture installation at The Joule..
GEOF KERN began his career as a photographer in 1978 after graduating from Brooks Institute of Technology in California and moving to Dallas to accept a studio position. He left to open his own studio and began photographing fashion for the Dallas Morning News. Kern began to photograph essays and story illustrations for GQ, Rolling Stone, and Esquire, and worked as a contributing editor for Spy Magazine. His fine art photography is represented by PDNB Gallery. JOHN SUGHRUE established Brook Partners in 1994 and has developed numerous central Dallas real estate projects. His current focus includes the transformation of River Bend located at 2025 Irving Boulevard in the Design District into a vibrant retail, showroom, and creative office community that celebrates the intersection of culture and commerce. He is a co-founder of the Dallas Art Fair as well as a founding director of Veritex Community Bank and serves as president of the Dallas Contemporary. KEVIN TODORA uses the photograph as the foundation for his sculptural work by experimenting with everyday objects, taking them out of their usual contexts and placing them into unexpected photographic tableaux. He earned his MFA from Southern Methodist University and his BFA from the University of Texas at Dallas. In 2013, Todora was the subject of a solo exhibition at Dallas Contemporary. His work is represented by Erin Cluley Gallery and is held by the Toyota Motor Corporation North America collection he photographed this issue. SIMPLY THE BEST HALL Arts Residences offers the perfect blend of art and living with an exclusive collection of up to 50 luxury homes in the heart of the Dallas Arts District. For a personal introduction to HALL Arts Residences, contact Lea Anne Laughlin at 214.269.9535 or llaughlin@hallgroup.com. The designs, features and amenities depicted are subject to change and no assurance is made that the project will be of the same nature as depicted or that the project or the condominium units will be constructed. This is not an offer to sell, or solicitation of offers to buy condominium units in states where such offer of solicitation cannot be made. 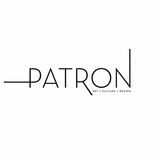 is published 6X per year by Patron, P.O. Box 12121, Dallas, Texas 75225. Copyright 2019, Patron. All rights reserved. Reproduction in whole or in part without express written permission of the Publisher is strictly prohibited. Opinions expressed in editorial copy are those of experts consulted and do not necessarily reflect the opinions of the editors, publisher or the policy of Patron. Unsolicited manuscripts and photographs should be sent to the address above and accompanied by a self-addressed stamped envelope for return. Publisher will take reasonable precaution with such materials but assumes no responsibility for their safety. Please allow up to two months for return of such materials. Self-Portrait No Pretense | Mixed Media on Canvas | 72 x 72 in. THE LATEST CULTURAL NEWS COVERING ALL ASPECTS OF THE ARTS IN NORTH TEXAS: NEW EXHIBITS, NEW PERFORMANCES, GALLERY OPENINGS, AND MORE. www.riverbenddallas.com Commissioned tile mural by Clare Woods. Courtesy of the artist and Simon Lee Gallery, London/New York/Hong Kong. Highland Park | Dallas 5 Bed / 4.1 Bath | 5,949 sq. ft.
Hal Thomsonâ&#x20AC;&#x2122;s architectural genius and Wilson Fuquaâ&#x20AC;&#x2122;s talent in restoration. All material presented herein is intended for informational purposes only. Information is compiled from sources deemed reliable but is subject to errors, omissions, changes in price, condition, sale, or withdrawal without notice. All measurements and square footages are approximate, but not guaranteed and should be independently verified. This is not intended to solicit property already listed. Nothing herein shall be construed as legal, accounting or other professional advice outside the realm of real estate brokerage. Compass is a licensed real estate broker. Equal Housing Opportunity. The must-have photography monograph of the year, this lavish oversized volume celebrates David Yarrow’s unparalleled imagery. 4636 Chapel Hill Road 1.6 Acres n $6,750,000 For a private tour, please call 214.763.1591. Thornton Dial (1928–2016), Construction of the Victory, 1997, 83.5 x 114 x 13 in. Courtesy of the Dallas Museum of Art and the Souls Grown Deep Foundation. Annie Mae Young (1928–2013), Yo-Yo, 1971, 80 x 83 in. Courtesy of the Dallas Museum of Art and the Souls Grown Deep Foundation. his past November, the Dallas Museum of Art acquired works from the Souls Grown Deep Foundation (SGDF). Facilitated by SGDF President Maxwell Anderson (formerly the Eugene McDermott Director of the Dallas Museum of Art and the Alice Pratt Brown Director of the Whitney Museum of American Art), the initiative also included acquisitions by the Brooklyn Museum; The Morgan Library & Museum; Museum of Fine Arts, Boston; and Spelman College Museum of Fine Art. The DMA acquisition, a partial gift/partial purchase from the foundation, includes works by Thornton Dial, Ronald Lockett, and Nellie Mae Rowe, along with four quilts created by female artists from Gee’s Bend, Alabama: Louisiana Bendolph, Mary Lee Bendolph, Amelia Bennett, and Annie Mae Young. Dallas collector Marguerite Hoffman purchased a second Thornton Dial painting, Two Coats (2003), from SGDF and has promised the piece to the DMA. The work of these African American artists will be on view at the museum as part of America Will Be! : Surveying the Contemporary Landscape, curated by Anna Katherine Brodbeck, which opens on April 6 and continues through October 6, 2019. The Souls Grown Deep Foundation collection represents the work of more than 160 artists, including over 1,100 pieces. Maxwell Anderson says the foundation’s “core mission is to advocate for artists of the African American South represented in our collection.” SGDF is the only nonprofit organization dedicated to preserving, documenting, promoting, and dispersing the work of these artists into museum collections to foster accessibility to the public. Mary Lee Bendolph (b. 1935), Blocks and Strips, 2004, 83 x 73 in. Lawrence Weiner in Iceland, 2014. Courtesy of the artist and Lisson Gallery. Gene Jones at AT&T Stadium in front of Lawrence Weiner’s BROUGHT UP TO SPEED, 2009. Gene Jones has spent a lifetime in the pursuit of helping others, undertaking numerous philanthropic efforts including major support of The Salvation Army. Gene’s vision and commitment to the arts is responsible for the Dallas Cowboys Art Collection, which features work by 56 contemporary artists and 86 works of art at both AT&T Stadium and The Star of Frisco. A dedicated supporter of the arts, she is a member of the Board of Directors for the AT&T Performing Arts Center and the Texas Cultural Trust Board along with numerous arts organizations. old, quasi-pastel tones confuse the structures they lie upon, barely wrapping up their odd angles and moments of queer intersection. Surfaces, walls, and the occasional stray object go on way too long or are off in another slightly undiscernible manner. Textures and patterns seem too perfect, alleys impossibly ramble about nearby. There’s a lingering emptiness to the scenes presented; assembled stages stuck on pause while waiting for actors and crew to return to set. Our eyes rummage about looking for clues of conception, all the while being caught up in the “realness” of the perceived image. Above: Leigh Merrill with proof prints for American Martini, an upcoming exhibition at Liliana Bloch Gallery. Right: Studio view. into “TODAY’S EXTRAORDINARY,” or build your own estate in this prime location. One of five architect-designed homes in the 1920s on historic Lakeside Drive, between Armstrong and Wycliff, this treasure, designed and built by architect Harre Bernet, for the Owens family in 1922, is coming on the market for the first time in 75 years. A one-of-a-kind snapshot into the history of Highland Park. 0.59 Acre | $3,795,000 For a private tour, please call 214.763.1591. DSOâ&#x20AC;&#x2122;s Music Director Designate, Fabio Luisi, will take the podium during SOLUNA. Courtesy of the Dallas Symphony Orchestra. Andrew Scott of the University of Texas at Dallas. Andrew Scott came to UTD five years ago from the Savannah College of Art and Design, having studied sculpture at Ohio State, something he still pursues in a space big enough for welding at Trinity Groves. He met Terence Blanchard when both of them were in Brooklyn. They mostly lost track of each other, but teamed up years later when Blanchard posted a call for an album cover and Scott replied with the winning proposal. The two of them have been working together ever since, and to fantastic effect, as I discover the minute I walk into Scott’s enormous warehouse of a studio in the Edith O’Donnell Arts and Technology Building, whose architects must have designed with someone like him in mind. With three students—no, four—working quietly to one side on the show for the Majestic Theatre, where Caravan can be seen April 9, Andrew Scott explains the powerful and purposeful screen overhead where symbols of every description declare a world of complicated harmony—Celtic, Tao yin and yang, Muslim, Christian, and Jewish, with Ankh, the ancient Egyptian sign for the breath of life, soon to be added. Scott leaves nothing out but much to chance as these symbols, deeply reminiscent of the Jungian unconscious, yield to a dove of peace flying slowly, seductively, across the screen. At the same time, Blanchard’s music, arriving by computer that afternoon, softens to a piano, poignant as well as faintly promising. Black and white dissolve into a panoply of color on which dancers will be projected from the stage as will the musicians of Blanchard’s E Collective. Call it psychedelic. Call it the aesthetic of hypertech. But, above all, call it by Andrew Scott’s watchword, improvisation. Verdigris Ensemble will perform in Anthracite Fields. Photograph by Dickie Hill; DSO composer in residence Julia Wolfe’s Anthracite Fields received the 2015 Pulitzer Prize in Music. Photograph by Peter Serling. Top left: New York–based artist and composer Aki Onda will activate the galleries at the Crow Museum of Asian Art. Photograph by Brian Whar; Top right: Queens-based vocalist Samita Sinha will perform with Aki Onda. Photograph by Renee Morello. Bottom: Academy Award–nominated trumpeter and composer Terence Blanchard performs at The University of Texas at Dallas in The Edith O’Donnell Arts and Technology Building on April 21, 2017. Photograph by Roxanne Minnish. OPENING IN THE GALLERY’S NEW LOCATION IN THE DESIGN DISTRICT. 150 MANUFACTURING STREET, SUITE 210 DALLAS, USA ERINCLULEY.COM Double Eclipses, 2018, Plywood, wood,changing LED lights, 44 in diameter x 6 in. ¯ Egill Sæbjörnsson, Ugh and Bõögâr descend upon Downtown Dallas. Courtesy of the artist and i8 Gallery, Reykjavík, Iceland. Improvisational and multidisciplinary artist Lonnie Holley will perform at the Dallas Museum of Art. Eggersmann’s Unique Collection is available in over 20 raw materials through the Eggersmann showroom on Hi Line. Artistic Tile’s Sail Fete gets its inspiration from Italian Cosmati Floors. Available at Artistic Tile in the Dallas Decorative Center. Tom Dixon Melt Pendants in copper and gold available at Scott + Cooner in the Dallas Decorative Center. Artistic Tile’s Primal mood board; Tom Dixon Melt Stand Chandelier at Scott + Cooner. Ornare’s clean and innovative Wave line designed by Ricardo Bello Dias is available exclusively at Ornare in the Dallas Decorative Center. Thayer Coggin Cool Clip sectional and Nikolas Kage cocktail table available at McGannon in the Dallas Decorative Center. Eggersmann’s 15 Square freestanding installation available at Eggersmann on Hi Line. Left to right: Harry Winston Forget-Me-Not Necklace featuring blue sapphires and diamonds set in platinum, Harry Winston Open Cluster Diamond Necklace set in platinum, Harry Winston Emerald Cut Aquamarine Earrings featuring diamonds set in platinum, Harry Winston ForgetMe-Not Bracelet featuring blue sapphires and diamonds set in platinum, Harry Winston Loop Diamond Necklace set in platinum. All at Harry Winston, Highland Park Village. I b e lie ve creat i vi ty i s the very essence of l i fe. I t un ite s us, i nspi res u s, chal l enges and changes u s. I AM TAC A – The Arts C ommuni t y Al l i ance. Alec Egan with his paintings (from left): Fireplace and Mantle, oil on canvas, 60 x 48 in. ; Sunset Mountain, oil on canvas, 60 x 48 in. ; Light, oil and Flashe on canvas, 60 x 48 in. ; and Sea, oil on canvas, 60 x 48 in. Opposite: Alec Eganâ&#x20AC;&#x2122;s Los Angeles studio. desert dwellers who live off the grid. And as her work investigates the world through a unique lens, she is also drawn to literary reexaminations. When we spoke, Crow had recently finished reading Madeline Miller’s novel Circe, with its re-imagined tale of the Greek goddess. Literature and film, she divulges, nurture her imagination the most. “I feel like I’m thinking less about other painters. They’re always in the back of my mind but I’ve veered more towards writers or filmmakers,” she says. Among her favorite authors is George Saunders, whose storytelling ability she particularly admires. The filmmakers currently on Crow’s radar include Chloé Zhao, Yorgos Lanthimos, Pawel Pawlikowski, and Peter Greenaway. The ability to create the layered, nuanced worlds portrayed in their films is reflected in Crow’s practice. Using a range of media, including phototransfer, spray paint, acrylic, and oil paint, each of her canvases is built up over several layers. The effect is one of walking onto a carefully crafted film set. Creating this dimensionality is time consuming. It usually takes about a month to complete each painting. Though Crow currently lives and works in Los Angeles, North Texans might be interested to know that she was born and raised in Dallas. She attended college on the East Coast where she earned her B.F.A and M.F.A. at New York University’s School of Visual Arts and Yale University, respectively. After a stint living in Europe, where her work has also been shown extensively, she relocated to the West Coast. “I love being in California with its wide-open desert spaces,” she emphasizes. This affection resonates in her work, with its massive scale and infinite depth. As a featured artist with the New York–based gallery The Hole, Crow looks forward to her paintings making their hometown debut at this year’s Dallas Art Fair. 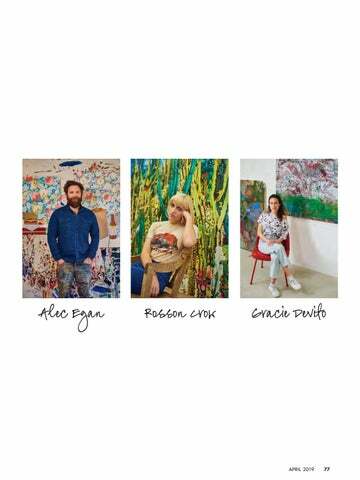 This page: Dallas-born filmmaker and artist Rosson Crow in her Los Angeles studio. Opposite: Rosson Crow, States of Shock, 2018, acrylic, spray paint, photo APRIL 2019 81 transfer, oil, and enamel on canvas, 66 x 90 in. Image courtesy Honor Fraser Gallery. Above: Los Angeles–based painter, sculptor, and performance artist Gracie DeVito in her studio with (from left): Gracie DeVito, The Maestro, 2018, oil on canvas, 51.75 x 58 in. and Autumn’s Child, 2019, oil and acrylic on canvas, 48.5 x 51.5 in. Left: Gracie DeVito, Slide Guitar, 2019, oil on canvas, 46.5 x 65.5 in. Courtesy of the artist and 12.26. Gracie DeVito, Mezzo Grappa, 2017–2019, oil, acrylic, sand, on canvas, 52.5 x 58 in. breaking the mold Examining the practices of three disparate sculptors showing work at Dallas Art Fair. Chaouki Choukini, Tendence carrée, 1997, Ebène vert wood, 20.27 x 3.34 x 18.30 in. Saleh Baracat Collection. Courtesy of the artist and Green Art Gallery. Artist Chaouki Choukini at work. Courtesy of the artist and Green Art Gallery, Dubai. Chaouki Choukini, Lyrique 2, 2011, 21.65 x 15.74 x 63 in. Courtesy of the artist and Green Art Gallery, Dubai. Chaouki Choukini, porte du désert, 1995, Ebène vert wood, 10.23 x 16.33 x 11.02 in. Courtesy of the artist and Green Art Gallery, Dubai. Chaouki Choukini, Pavillon de Lumiere, 2014, Iroko wood, 24.4 x 7.87 x 7.87 in. Photograph by Alex Wolfe. Courtesy of the artist and Green Art Gallery, Dubai. Sculptor Tony Matelli with a work from his popular Weed series. Tony Matelli, Horse, 2017, stone and painted bronze, 22.5 x 34 x 10 in. Courtesy of the artist. rtist Tony Matelli creates works of art that are eye-catching and thought-provoking with unexpected elements of humor and surprise—a warrior draped in deli meats, a horse with a head of lettuce, or Caesar with a stash of half-eaten fruit. His realistic subject matter is decidedly everyday, incorporating “faux antiquities” or found garden sculptures with that of “perishable objects frozen in time” made of painted bronze in the shape of fruits, vegetables, and meats. These vanitas sculptures capture the passage of time—an abandoned garden sculpture that is at the end of its life juxtaposed with that of shiny and seductive fruit at the height of its potential. Co-organized by Marlborough Contemporary, six of Matelli’s sculptures will be installed in the lobby of The Joule during the Dallas Art Fair. Born in Wisconsin, Matelli credits his imagination to his childhood. To escape the cultural landscape of the Midwest, he created dioramas, building his own fantasy narratives using model cars and action figures. This sign of “tinkering as a kid” led the artist to a new way of thinking about representation in art school. Matelli questioned, “What happens if I make this tiny diorama larger?” During his undergraduate studies at Milwaukee Institute of Art and Design, the sculpture department offered him the freedom to explore compelling narratives. After attaining his B.F.A., he pursued graduate studies at Cranbrook Academy of Art. Even though he started as a conceptually oriented artist, he considered the conceptual realm to be “visually boring” and lost interest in it. “I reached towards realism and it felt radical at the time, but in reality, it was a return to my roots,” says Matelli, referring to the tradition of representation that permeates art in the Midwest. Tony Matelli, Woman with Bowl, 2017, concrete and painted bronze, 66 x 19 x 21 in. Courtesy of the artist. Today, the artist runs a hands-on Brooklyn studio where most of his works are made onsite. His artistic process starts with a collage where he gathers his inspiration to determine the viability of his ideas. His choice of materials stems from a sense of efficiency rather than a philosophical choice. Most of his concrete or marble garden sculptures start with a found object, which serves as the perfect base, albeit reborn with the addition of a piece of fruit or meat made of painted bronze. This material creates a very realistic impression of bright colors yet also remains durable for transport and display, both indoor and outdoor. The artist finds bronze to be rewarding—it happens to be “cool,” yet has been used since ancient civilizations, reflecting the historical continuity of materials. Matelli adds, “There’s a bit of magic or fooling the eye in my work, and there’s a sense of wonder but it’s not really the goal.” Fascinated by the passage of time, Tony Matelli presents his own perception of reality with the symbolism of old and new in his sculptures. When asked about how the viewer experiences the work he explained, “I think of myself as the viewer, I am the primary viewer of my work. I work to my own tastes, and I assume everyone will eventually be sharing my own taste.” It’s this unique perspective, along with the virtuosity, technical skill, and execution that have made Tony Matelli an international success with private collectors, museums, and institutions. Multidisciplinary artist Zoë Buckman inside her New York apartment in DUMBO. Above: Zoë Buckman addresses motherhood and domesticity, and the power and oppression of each, in her practice. Below: Zoë Buckman (b. 1985), Fool, 2019, embroidery on vintage tea towel, 22.25 x 14.75 in. Courtesy of the artist and Albertz Benda. The artist embroiders vintage tea towels. os Angeles–based painter Jonas Wood (b. 1977), named the 2017 Artist Honoree by TWO x TWO for AIDS & Art, unveiled his first major solo museum exhibition last month at the Dallas Museum of Art, gathering 33 works across 13 years. With multiple comparisons to David Hockney, Wood’s examinations of the commonplace reveal intimate observations of universal themes through worlds conjured from sources including drawings, preparatory collages, and found imagery. His paintings reference modernist and Pop movements while remaining rooted in the contemporary, resulting in pictorial flatness derived from objects, people, and places. Accompanying the exhibition is a catalogue, Jonas Wood, published by the DMA and distributed by Yale University Press, which offers a scholarly consideration of Wood’s practice in an art historical context. Hans Ulrich Obrist, who is the Artistic Director of Serpentine Galleries and the Senior Artistic Advisor of The Shed, New York, as well as a prolific writer and curator, contributed an interview with the artist for the publication. 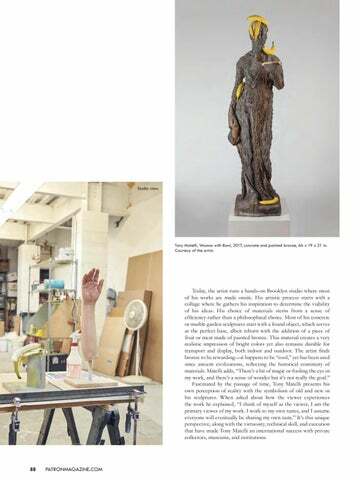 In an excerpt from that interview, Obrist discusses Wood’s manifold influences, including his grandfather, who was an amateur painter and art collector; the ceramic works of his wife, artist Shio Kusaka; baseball and basketball trading cards; source material from old books; and art collecting. Hans Ulrich Obrist (HUO): Jonas, your new solo exhibition of paintings at the Dallas Museum of Art includes portraits, still lifes, interiors, and exteriors. You describe the interiors as a stage, and the stage, of course, includes not only people, but images of your art, of others’ art. There is art from ceramics in it. There is part of your collecting activity. It’s all of that. This page, clockwise from top left: Jonas Wood. Portrait by Brian Forrest. Courtesy of the artist; Jonas Wood, Big Naked Snakes, 2012, oil and acrylic on canvas, 80 x 68 in. Photograph by Brian Forrest. Courtesy of the artist and David Kordansky Gallery, Los Angeles; Jonas Wood, Greek Pot with Pattern, 2011, oil and acrylic on canvas, 23 x 20 in. Photograph by Brian Forrest. Courtesy of the artist and Shane Campbell Gallery, Chicago; Jonas Wood, Self Portrait with Blue Sunglasses, 2012, oil and acrylic on canvas, 50 x 60 in. Photograph by Fredrik Nilsen. Courtesy of the artist and David Kordansky Gallery, Los Angeles. Opposite: Jonas Wood, Interior with Fireplace, 2012, oil and acrylic on canvas, 102 x 92 in. Photograph by Fredrik Nilsen. Courtesy of the artist and David Kordansky Gallery, Los Angeles. Jonas Wood (JW): My interest in ceramics comes from my wife, Shio Kusaka, who is a ceramicist. When I started making still lifes, I was using her work as part of it, looking at pots with her, and just getting into the idea of things painted on a pot. It’s an object that tells a story. It’s very similar to a painting, but it’s this threedimensional vessel. HUO: You said that it’s like the baseball cards, the basketball cards…They have a shape and form: fluid, graphic, simple. There are cartoons on the side of the pots. They’re stories, right? So, you started to make all these pots paintings, and you were inspired by the Met, also. JW: That’s where it all started. It also connects to my wife because when we started going to museums together, I would always look at just the paintings. But since she was interested in vessels, I started looking at vessels, too. I think that I super-responded to the black and orange vessels at the Met. They just became another thing I liked to paint. In my own paintings there are genres that I like to paint, and I’m responding to them because they turn me on and make me want to make art about them, to paint them. I realized with the things that I find the most titillating, it’s okay to keep going back to them. You can continue learning even if it seems like the same thing. HUO: What’s the relationship between figuration and abstraction? You once said in an interview that your paintings of tennis courts are about your interest in abstraction. The court becomes a geometric puzzle. Yet at the same time, you’re a figurative artist, out of pots instead of plants. It seems to oscillate between moments of figuration and abstraction? JW: I don’t always think about it as “I’m a figurative painter,” or “I’m an abstract painter.” I prefer to look at it as a puzzle and how it’s balanced, which I think is similar to how an abstract painter would think about how a painting would work. Like, is it working, or is it not working? It’s based on composition, and it’s based on color. I think I’m comfortable with painting object paintings. What I consider an object painting is what other people might think is abstract. A tennis court would be like an object; it’s a tennis court. To me, it’s definitely a figurative thing. But the way I’m painting it is This page, left: Jonas Wood, Manute, 2014, oil and acrylic on canvas, 120 x 48 in. Photograph by Brian Forrest. Courtesy of the artist and David Kordansky Gallery, Los Angeles. Right: Jonas Wood, Moiten Ball, 2015, oil and acrylic on canvas, 20 x 20 in. Photograph by Brian Forrest. Courtesy of the artist. Opposite: Jonas Wood, Australian Open Two, 2012, oil and acrylic on linen, 88 x 60 in. Photograph by Brian Forrest. Courtesy of the artist and David Kordansky Gallery, Los Angeles. Jonas Wood, The Bat/Bar Mitzvah Weekend, 2016, oil and acrylic on canvas, 88 x 69 in. Photograph by Brian Forrest. Courtesy of the artist and Anton Kern Gallery, New York. Top: Jonas Wood, Snowscape with Barn, 2017, oil and acrylic on canvas, 106 x 120 in. Photograph by Brian Forrest. Courtesy of the artist and David Kordansky Gallery, Los Angeles. Bottom: Hans Ulrich Obrist. Photograph by Wolfgang Tillmans. Isa Genzken, Rose, 1993–1997 steel, aluminum, lacquer, approximate height 314.96 in. on generations of younger artists. In recent years assemblage has been at the forefront of contemporary sculptural practice and Genzken has been at the center of that.” Born in 1948 in northern Germany, Genzken grew up in the aftermath of World War II, a period marked by the reconstruction of bomb-ravaged cities and the reconciliation of a nation with its dark past, divided present, and seemingly bleak future. Raised by self-described “art freaks,” Genzken was exposed to art and culture from an early age. Her family relocated to the more cosmopolitan and capitalist West Berlin in 1960, the same year she first visited New York City. The two cities have consistently informed her work. Genzken went on to study art, art history, and philosophy at institutions in Hamburg, Berlin, and Cologne before being accepted to the prestigious Düsseldorf Academy in 1973, where professors included photographers Bernd and Hilla Becher, Fluxus artist Joseph Beuys, and her future husband, painter-sculptor-photographer Gerhard Richter. Isa Genzken, OIL XV / OIL XVI, 2007, installation wall piece comprised of 23 panels in 3 segments, aluminum, metal foil, adhesive tape, metal, printed paper, 104.33 x 177.17 in., 104.33 x 177.17 in., and 106.30 x 51.97 in. ; floor piece in 6 parts comprised of 2 mannequins, 2 plastic cases, 1 glass bowl, metal foil, plastic, fabric, 35 x 220 x 380 in. Above: Isa Genzken, Weltempfänger, 1988-1989, concrete and steel, 84.65 x 62.99 x 15.75 in. ; right: Isa Genzken, Schauspieler II, 8, 2014, black child mannequin on glass stand, life-jacket, silver mirror foil, passport, woolen jumper, American football helmet, spray paint, 60.63 x 17.72 x 15.75 in. Isa Genzken, Empire/Vampire III, 16, 2004, mixed media, metal, glass, plastic, lacquer, wood, 65.75 x 23.62 x 18.11 cm. Isa Genzken, Leonardo, 2016–2017, concrete, antennae, MDF, adhesive tape, 90.55 x 28.35 x 11.81 in. Above, left: Isa Genzken, Hallelujah (Yellow), 2012, MDF, metal, plastic, glass, mirror foil, perspex, globe, plastic figure, casters, 100.79 x 39.76 x 21.65 in. ; right: Isa Genzken, Spielautomat, 1999–2000, slot machine, paper, chromogenic color prints, tape, plastic foil, 62.99 x 25.59 x 19.69 in. Francisco Moreno, (Mexican-American, b. 1986), Mural Commission for the Toyota North American Headquarters Campus, 2017, vinyl. ustainability is more than a marketing word for the Toyota Motor Corporation. It is an ethos that permeates its physical footprint and the corporate culture at its North America headquarters in Plano. From the LEED Platinum certification of its buildings with its surrounding native landscaping to its extraordinary art collection, the company exemplifies possibility. Jim Lentz, CEO of Toyota Motor North America, says, “In 2014, when we announced our decision to move our North America headquarters from California to Plano, we wanted to make sure the new home for our 4000+ team members was a world class experience both on the outside as well as the inside.” Toyota’s move allowed it to consolidate operations that had previously been spread across four states and three time zones. An added advantage of moving to Collin County was the availability of land, making it possible to build a 100-acre campus encompassing three million square feet of space spread across seven buildings. The design for this project fell to architecture and design firm Corgan. Garry Walling, Corgan’s Interior Design Project Manager and Vice President, worked with his team to create a corporate oasis. In addition to workspace, the campus includes ample amenity areas located primarily around The Loop, a ground floor ring connecting the buildings. “The company was looking for design that was fresh, clean, and modern,” Walling says. Connectivity served as the guiding principle, he adds. Mika Tajima, (American, b. 1975), Negative Entropy (Toyota Airjet, Yellow, Hex Horizontal), 2016, cotton, wood, acoustic baffling felt. Kevin Todora, (American, b. 1977), Bottles and Lemons (Toyota commission), direct inkjet on MDO. John Holt Smith, (American, b. 1968), Untitled, 2017, giclĂŠe on dibond. John Pomara, (American, b. 1952), Flower Glitched Wall Series, 2014, glitched vinyl adhesive, unique glitched photo with spray paint. Jackie Saccoccio, (American, b. 1963), Portrait #11 (Helen), 2017, gouache and ink on Yupo paper. Shinpei Kusanagi, (Japanese, b.1973), beyond, 2009, acrylic on canvas. Teresa Hubbard (Irish/American/Swiss, b. 1965) and Alexander Birchler (Swiss, b. 1962), Eiffel Tower, Paris, Texas, 2009, archival digital print. characteristic Works from Allison V. Smith’s twenty-year exploration of the landscape, light and personality of Marfa and West Texas. This page: Rochas brocade flat mules, Carla Martinengo, Plaza at Preston Center. Opposite: Mary Katrantzou dress, Carla Martinengo, Plaza at Preston Center. One morning spring awakened and imagined itself . Models: Elizabeth Freeman (Kim Dawson Agency) and Anna Kern; Hair and makeup: LB Rosser (Kim Dawson Agency); Photography assistants: Elliot Kern and Joseph LaCerte; Flowers: Adam Rico, Bows & Arrows; Dolce & Gabbana sandal in soft lurex and mordorĂŠ nappa leather with sculpted heel, Carla Martinengo, Plaza at Preston Center. © MMXIX Sotheby’s International Realty Affiliates LLC. All Rights Reserved. Sotheby’s International Realty Affiliates LLC. An Equal Opportunity Company. Equal Housing Opportunity. Briggs Freeman Real Estate Brokerage, Inc. is independently owned and operated. Come browse an incredible oﬀering of contemporary art from the frontrunners of today’s art scene at KAABOO ARTWORK, a dynamic contemporary art program featuring an indoor art fair at KAABOO TEXAS 2019. Join us for an unforgettable weekend of music, contemporary art, culinary craft, fashion and personal indulgences. You just might ﬁnd the perfect work of art you’ve been searching for. TAKE ME TO THE RIVER Clare Woods harnesses the ebb and flow of the Trinity for a new Dallas development. Clare Woods’ site-specific 11-paneled installation is based on the Trinity River and was commissioned by the Dallas Art Fair through Simon Lee Gallery (London, New York, Hong Kong) for River Bend. Fun. Free. Exclusively at the DMA. 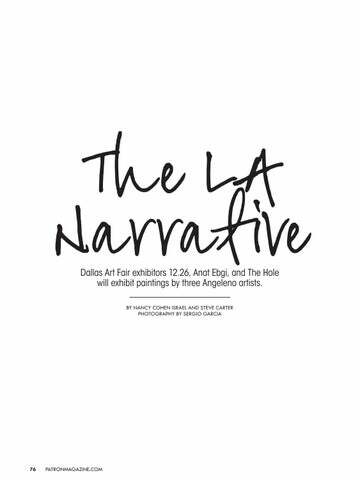 Dallas Art Fair exhibitors 12.26, Anat Ebgi, and The Hole will exhibit paintings by three Angeleno artists.